For a number of reasons I have not been attending to my affiliation with your fine organization. And now with the many changes in travel and the devaluation of the dollar I have found it necessary to consider my exchanging at an end. We have had six exceedingly successful and enjoyable exchanges. The memories of them (and all the pictures from the experience) will continue to bring great pleasure to us. One of the best results of the exchanges has been that we have stayed in contact with each of the six families we have had the great joy of meeting and now counting among our friends. It is possible that we may see them again. 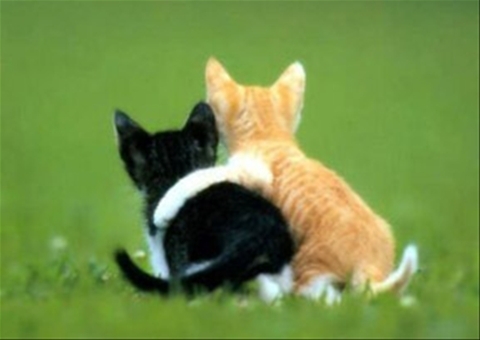 Thank you for the many kindnesses and courtesies you have extended to me. Those, too, will remain a warm memory. Home exchange listings that include a few well chosen photos look much more attractive than description only listings, no matter now enticing a descriptive offer may be. Photos draw attention to a listing, making it more likely that a member browsing listings will take time to read the offer in full and contact the member. Now there's another good reason to add photos to your listing as soon as possible after joining Home Base Holidays. At the suggestion of a member (a big Facebook fan I think! ), thumbnails (small versions of the main photo in listings) are now included within the private member area in four places - in listings that are saved to 'Favourites', a list of members recently contacted, all messages received (inbox) and in all messages sent to other members (sent folder). Not only do the small photos make the member area much more colourful, and act as an enticement to view a new exchange offer in full, they are also great visual reminders of exchange offers in messages to and from other members. If you are a current Home Base Holidays member but haven't yet got around to uploading photos, now's a good time to do it. Log on to your member area and click Edit Photos. Ilse is right to start looking for an exchange in London well in advance of the date the family plans to move to London, not only because she needs to find a school for her daughter but also as arranging exchanges for lengthy periods, especially for a year or more, can be much more difficult that for shorter holiday periods. However, Ilse has a wonderful exchange offer so, surely, from the many Home Base Holidays members living in London, one lucky Londoner will be able to take advantage of this great opportunity to spend time in San Pedro. 'A refurbished and beautifully decorated home (eclectic style) by my husband, an architect. It has appeared in a Latin American architectural magazine and on T.V. It is not a large house (140 m2 total) but it truly is a "boutique" home. There is a small garden in the back, great for BBQs or eating outside. The house has wonderful features such as a sunken "Moroccan style" living room and a large kitchen. Our home is perfect for people who are urban but still appreciate warm weather & interesting culture, and escaping to great beaches on the weekends. I was a lecturer at the U. of C.R., but moved to the UK to pursue a Ph.D. at the U. of Edinburgh. René is an architect, working on designs for C.R. clients and studying English. Our daughter Gala is four and great! We went to London and fell in love with it. We need to find someone who wants to take a year or a year and a half off to learn Spanish (teach, work, etc.) and has a two bedroom flat or house in a relatively safe area of London, close to a good state school. 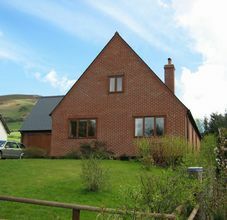 Read the full home exchange offer, HE20961, and see more colourful photos of the family's home. Even if you can't consider an exchange for as long as a year, but could consider a 'longish' exchange, it is worth contacting Ilse (log on to your member area). Some long-term home swappers, if unable to arrange an exchange to cover the whole period, arrange more than one swap and, if necessary, rent accommodation for any periods not covered by an exchange. Travelling, Traveling - What's in a Name? Or, in the case of home exchange, vacation vs holidays. As different spellings or terminology can be used for some common household appliances, there's a need for careful attention to anything that could possibly be misunderstood when arranging a home exchange, even between English speakers in different countries. 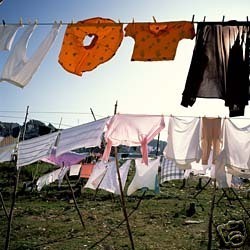 One example - a Canadian Home Base Holidays member once said she had looked all over the exchange home in England but never did find the promised 'clothes dryer'. I guess she never thought to look outside (clothes dryer = clothesline). Her exchange partners hadn't intentionally mislead her as they had never said there would be a 'tumble dryer' in their home! "I had several ideas about the name of this blog, but Really Traveling is what I finally settled on -although originally I was going to use the UK preferred spelling: 'Travelling'. I was alerted to the fact that this could be a problem when my Firefox spell-check decided that it didn't like the word... I quickly contacted a few (non-UK) internet cronies who all advised me that they would use 'Traveling' and fortunately that domain was available too..."
Although only three months old, this travel blog has already covered many topics. One travel site I discovered through this post on Really Traveling is the Low Cost Airlines Guide, a very useful tool for checking which budget airlines fly between all destinations in the UK and Europe. But oh dear, Really Traveling, do we really have to adapt to the use of American spellings everywhere? 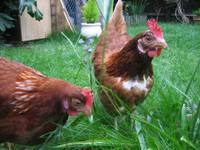 Home Exchange Offer: And the Freshest Eggs in London? I've often come across such extra perks in exchange offers for homes in the country - but this particular home is right in the heart of London. 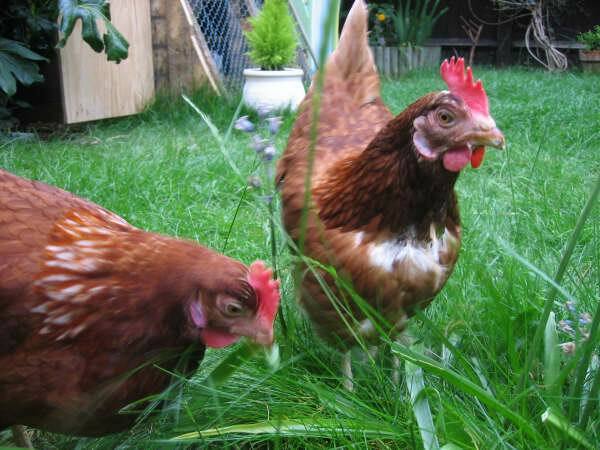 Exchange with the owners of this flat and you'll have the best of both worlds - a great base for visiting all London's attractions, then come 'home' and relax in a peaceful back garden, checking to see if Betsy and Colleen (pictured) have come up with the goods and provided your fresh eggs for breakfast. 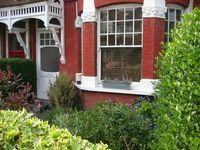 Helen (a Londoner) and Darren (Australian) offer their large Victorian one bedroom ground floor garden flat in Ealing, West London for exchange. Their home is close to lots of parks, restaurants and bars and the museums, galleries and nightlife in Central London are 30 mins away by tube. Kew Gardens and Richmond (on the Thames) are 15 mins by bus. Very occasionally an agreed home exchange has to be cancelled due to unforeseen circumstances. This has happened for Home Base Holidays member, Marianne, whose exchange partner in Amsterdam has had to cancel as her husband was taken ill and is in hospital. As Marianne has already bought non-refundable train tickets from Paris to Amsterdam for the period, 12-20 July, she is now looking for a replacement exchange in the city. Marianne's apartment is in a 1960s building in the center of Clichy, 2 minutes from the underground and bus; market and supermarket just down from the building. 3rd storey (60m2) apartment 3 rooms, (doorman and security door. Piano and hifi in each room, many books and DVDs. Situated on the n° 13 subwayline which crosses Paris (north-south) near the rer C from Orly and Versailles (marvellous Louis XIV castle). A good location for going anywhere in Paris. 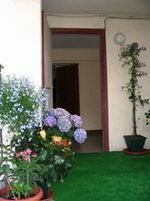 Read Marianne's full home exchange offer in Clichy and see more photos, HE10437.